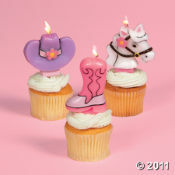 Pink Is For Cowgirls...Get Pink Cowgirls Birthday Party Ideas For Girls...Fun Party Games, Party Favors and Party Supplies For A Rootin Tootin Western Party. 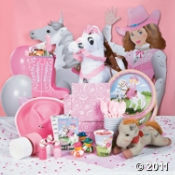 I just found a really big party supplies pack and the theme is a Pink Cowgirl Party. 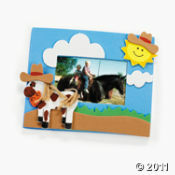 It's got everything you need to host a fun girls party and cowgirls are in this season. 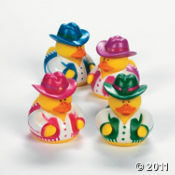 This package has paper party supplies, party favors, decorations all in white and pink, boot shaped favor bags, bubbles, rubber duckies dress as cowducks, an autograph horse, a pinata, pinata fillers and some pink cowgirl hats! Find it at a good price...you should check it out at the Oriental Trading Company. 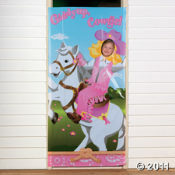 "Pink Cowgirl 19"" Pull-String Horseshoe Pinata"
"Pink Cowgirl Personalized Birthday Banner Standard 18"" x 61"""